Collective Soul’s mega-hit Shine is an anomaly in the angst-driven, grunge-dominat­ed scene of contemporary rock. This upbeat, feel-good song stands in direct contrast to the darker offerings by contemporaries like Soundgarden and Stone Temple Pilots. And why not? The three-guitar band from Georgia describe themselves as “positive guys” who know they’ve “got it pretty good.” Ed Roland is the leader, primary songwriter and part-conscious background rhythm guitarist. His brother, Dean, is the bashing, heavy rhythm player with Marshalls up to 10. Ross Childress is the “guitar player” of the group, who leads the way musically and adds the sophisticated touches. The lineup is rounded out with Shane Evans (drums) and Will Turpin (bass). It’s obviously a “pretty good” arrangement. There are two tunings used in Shine. The first (Gtr. 2) is standard tuning, down a half step. The second (Gtr. 1) is a bit more involved. Begin with the same tuning, but also lower the 6th string to Db, a whole-step lower, and raise the 3rd string a whole step higher to Ab. This odd D-A-D-A-B-E tuning produces a compromise between dropped D tuning and standard tuning and is unique to Shine. Ed Roland had the lick that opens Shine for seven or eight years prior to the recording, but never put it in a song. This main riff (Rhy. Fig. 1), heard in the intro and verses, uses a two-string drone effect in the first half, facili­tated by the Gtr. 1 tuning. Note that all the fretted notes in this section are played on the 3rd string while the open 4th string is pedaled below it [Fig. 1]. Note also the open 4th string is palm-muted consistently throughout the entire figure. In the second half, power dyads are added to the riff. Due to the tuning, these are fingered like 3rds [Fig. 2]. The D-A-D-A-B-E tuning also allows easier and more efficient fingerings for the power chords heard in the pre-choruses, choruses, behind the solo, and in the outro. The two-and three-note voicings can be fingered, as a barre either across the low two or the low three strings, and played with only the index finger or ring finger [Fig. 3]. Ross Childress’ guitar solo has a well-con­ceived structure. It builds from gutsy blues-based rock licks to more complex, multi-note flurries in two clear phrase sections. The first begins with a two-measure riff exploiting the time-honored Chuck Berry – inspired double-stops which have been part of the rock ‘n’ roll legacy since the 50s. These are played in the standard minor pentatonic blues box at the 10th position. The next run, in bars 3 and 4, is also played in the standard blues “box,” but is, by contrast, a blazing high-speed sequence lick. This seemingly complicated line can be easily understood and digested by looking at it in pieces. The run is basically a repetition of a pattern which moves across the strings in two-string increments. This pattern, or sequence, is a six-note figure made of two descending scale notes and a fast hammer-on/pull-off trill of four notes [Fig. 4]. The pattern repeats itself four times within the scale, each time moving to a higher two-string group [Fig. 5]. A slight variation is found in the fifth repeti­tion. This one uses two-hand tap-on tech­nique. The sequence is a staple of lead soloing and is found in the styles of countless players from Jimmy Page and Yngwie Malmsteen to Al Di Meola. The second half of the solo begins in the minor pentatonic scale form located three frets above the blues pattern. This D minor form is frequently used by blues and rock players as an extension of the basic E minor pentatonic when soloing, and it is a real advantage to ulti­mately see them as one connected scale [Fig. 6]. Notice the addition of an Ab note from the D blues scale as well as a Db chromatic passing tone in the quick run in measures 6 and 7. These tones add interest, melodic flow, and a tasty bit of tension in the solo. The final thoughts recall the beginning measures of the solo for a nice “bookend” effect. 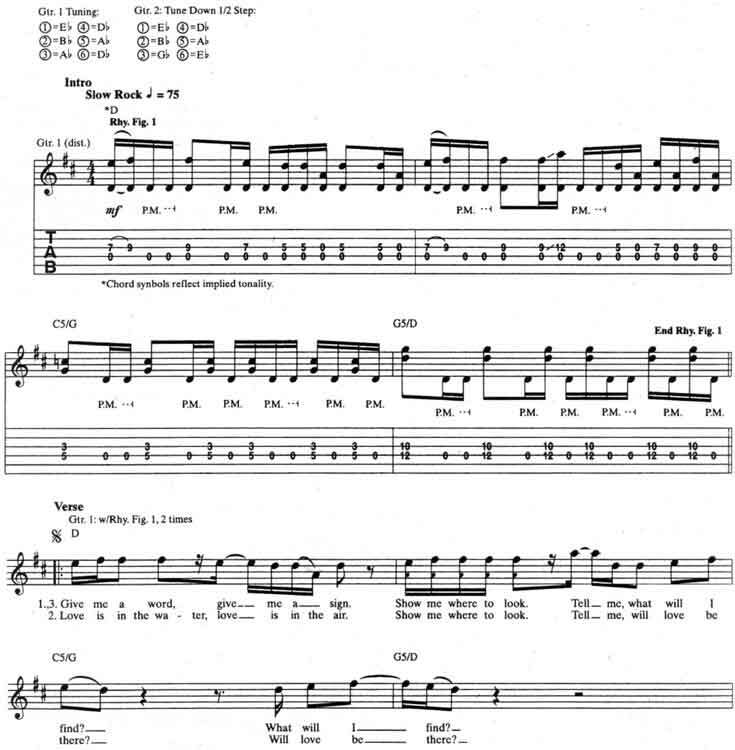 It’s a part of Collective Soul Shine guitar tab and sheet. © 2012 - 2019 TabsClub Powered by TabsClub 42 queries in 0.279 seconds.